While running the other day, I was thinking about how relaxed my pace was and that I’m actually a pretty slow runner. My pace is just under 11-minutes per mile (for a five-miler). I’d like to blame my body type, if I may, which can be described as short and stocky. As I was thinking this, the phrase “heavyset” entered my mind. Apparently some connection in my brain was made to a 40-year old memory! 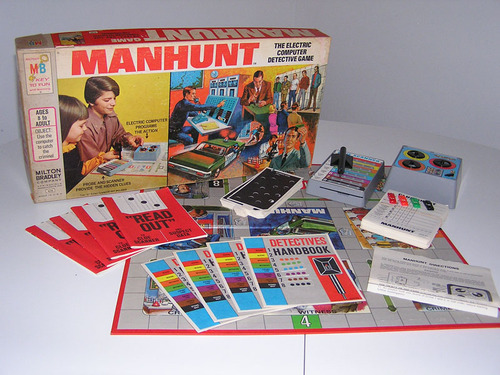 When I was a kid, we used to play a boardgame called “Manhunt” which was really cool because it had a pseudo computer, codes to figure out, and a detective handbook. Each player had to figure out who the criminal was, and one of the descriptions of the possible suspects was “Heavyset”. 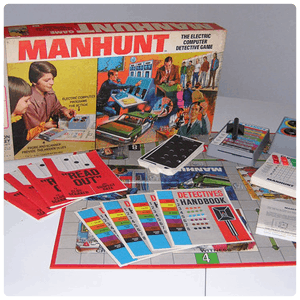 Thinking back to that time, I wonder how our family came about getting that particular boardgame. Did my parents just see it at the Toys R Us and decide it looked fun? Was it a birthday wish by one of my brothers? You’re doing a lot better than me running-wise. I can’t even call myself a runner yet. I’m still pushing between a power walker and slow jogger at a pace of 15.0 minutes per mile. But I’m OK with this pace, as this is a good workout for me. That’s great, though. Your fitness updates are good motivation for me. Any pace is better than sitting at home as far as I’m concerned. 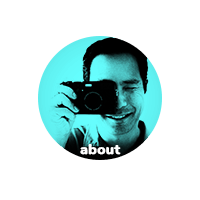 That’s why I don’t worry about pace during the run… I just focus on how I am feeling at the time. Keep it up, and I will too!